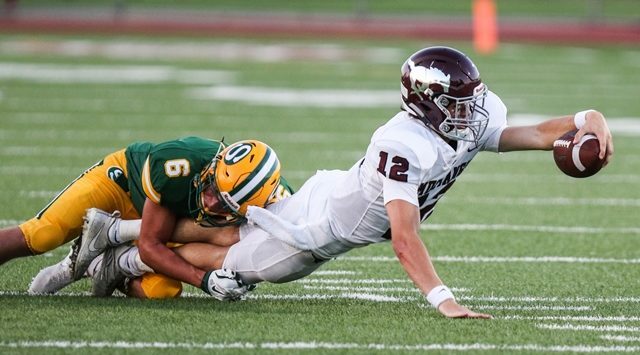 The Salina Central Mustangs traveled to Maize for a Top 5 showdown, but couldn’t keep pace with the Eagles, falling to 5-2 on the season with a 48-26 loss. It was tough sledding for both offenses in the first quarter. Maize kicked a 28 yard chip shot field goal with :02 remaining in the 1st to take a 3-0 lead. Salina Central was forced to punt after a clock-eating drive stalled, and Maize wide receiver Preven Christon returned it all the way down to the 12 yard line. Star running back Caden Cox punched it in three plays later, and Maize had their first double digit lead, 10-0 with 7:32 remaining in the second quarter. The Mustangs showed signs of life in the closing minutes of the second period. After Maize pinned the Mustangs deep at their own 14 yard line, Central drew up a picture-perfect screen play for running back Taylon Peters. With the vaunted Maize defensive line pinning their ears back, Jackson Kavanagh dumped it over the top to Peters, who weaved his way to the end zone for a 66 yard touchdown. After a blocked PAT, Maize led 10-6 with 40 seconds to go in the half. Maize countered quickly, and reclaimed momentum just 26 seconds later. Quarterback Caleb Grill, a South Dakota State basketball commit, looped a pass downfield for a 60 yard Camden Jurgensen touchdown with :14 to go before intermission. Leading 17-6 to start the third quarter, Grill would toss three more touchdowns on the first three drives of the stanza. Maize led 31-6 when Salina Central’s Ben Driver returned a kickoff 82 yards for a score. That Mustang touchdown made it 31-12 with 3:08 to go in the period, before Grill hit K.J. Hampton for a 42 yard touchdown to push the Maize lead to 39-12 on the very next play from scrimmage. Salina Central’s Kavanagh found Quinton Stewart open in the end zone for a 19 yard touchdown with 1:40 left in the third, which trimmed the lead to 39-20 after a successful 2-point conversion. Maize countered when Grill threw his fifth touchdown of the night, a 37 yard strike to Jurgensen with 8:46 to go in the final session. The Mustangs scored the final touchdown of the night, a 55 yard pass from Kavanagh to Logan Hiegle with 4:59 remaining. Field position plagued Salina Central from the opening kickoff. Maize started 12 of their 13 drives from their own 39 yard line, or better. Meanwhile, Salina Central started nine of their drives from inside their own 25 yard line. Kavanagh finished the night 10-21 passing, for 199 yards and three touchdowns. Peters carried the ball 14 times for 51 yards. He had 3 receptions for 84 yards and a touchdown. Grill led Maize with 290 yards through the air, and tied a career high with five touchdowns. Cox finished with 126 yards on the ground on 24 attempts. The Mustangs wrap up the regular season next Friday at home vs. Hays.